The centers of these Oreo truffles are made of crushed Oreos and cream cheese. That’s it. Cream cheese and Oreos have a magical relationship that makes them so creamy people will think you slaved over the stove with a candy thermometer. Lemon Oreos are my new favorite guilty treat. 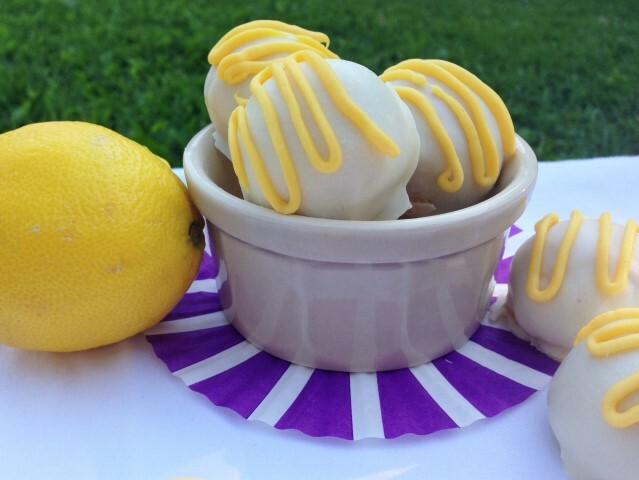 The lemon is just a perfect fit for the creamy Oreo filling. I’m not sure what I’m going to do if I can’t find them anymore. 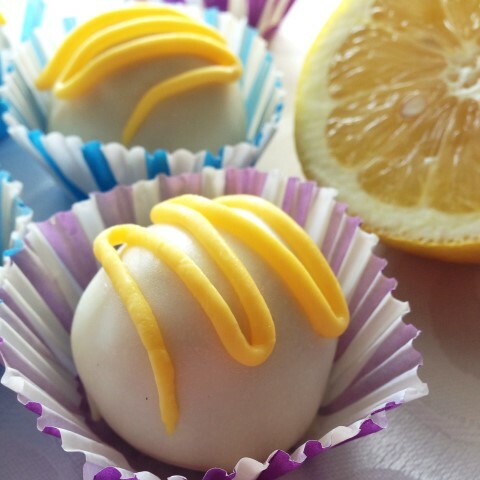 To make these truffles simple finely chop a package of lemon Oreos in the food processor. Beat the crumb and a package of softened cream cheese together until smooth. Roll into balls. Place in the freezer. Fold 2 batches of laundry and wash the dishes. Melt white chocolate in the microwave until smooth. Dip slightly frozen balls in white chocolate. Allow to harden. If desired, garnish with some white chocolate that has been tinted yellow. Enjoy! Pulse Oreos, filling and all in a food processor until finely ground. Beat together the Oreo crumbs and softened cream cheese until smooth. Roll mixture into balls using a generous tablespoon per ball. Place white chocolate in a deep bowl. Microwave for 10 seconds at a time until smooth, stirring after each time. 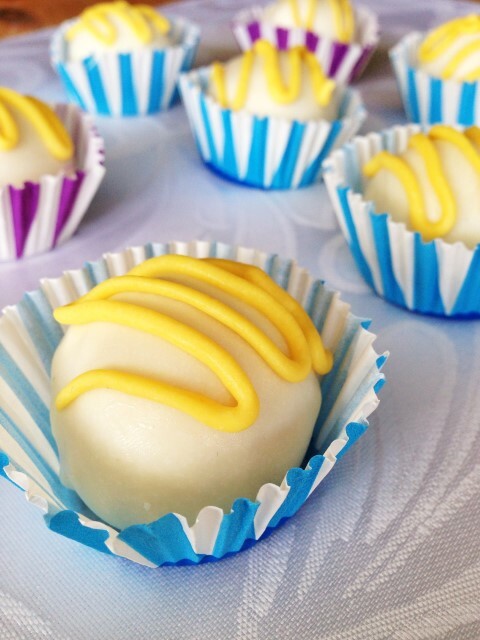 Dip balls into white chocolate and place on parchment paper to harden. 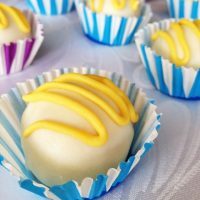 If desired, tint some white chocolate yellow with food coloring and drizzle truffles. * I am not sure what I am going to do if they ever stop making lemon Oreos. Perhaps I can try lemon extract with golden Oreos to get the same flavors. If you want to try this, let me know how it turns out. Lemon oreos are the greatest and I love what you created here with them! I’ve never had a lemon oreo! But I do love all things lemon so I hope I see them soon! I’ll definitely be making these, if I do! Thanks, Katie! I’ve been following along with yours when you post them on Facebook! These sound great! I was so excited when they came out with Lemon Oreos! Me too! I think the lemon Oreos are my favorite. It will be a tragic day when they stop making them! Any Oreos are great! but lemon is a spectacular way to switch them up a bit! Lemon and Oreo sounds like such a lovely combination! And they are so cute too! I have not seen lemon Oreo’s here in CT & I scan the Oreo display a couple of times a month! Lemon would be so nice for a summertime lunch. I have been making these ‘truffles’ for several years now & use whatever flavor fits the mood. Always on my Xmas cookie platter, using red & green melts as well. I think the mint & the peanut butter flavors are the family’s favorites. I haven’t seen them for awhile either. I’m wondering if I could use golden Oreos and lemon extract to get the same flavors. I’ll have to try it sometime and report back. Did you ever try that? I am very curious to know if plain golden oreos plus any liquid flavor/extract could mean opening the truffle door to WAY more flavors than we all thought possible! I haven’t tried it, but I don’t see why it wouldn’t work as long as you don’t add more than a teaspoon of liquid or so to the mix. I would store them in the refrigerator since they contain cream cheese. Enjoy! Well I made these and I had a terrible time trying to get the chocolate as nice as yours, and when I first melted it it took 1 minute, the 10 second thing didn’t work, I haven’t ate any of them yet but aesthetically they don’t look the same. Any tips on doing the chocolate part? Hi Maddie, Here is what I do. I use a deep container and melt the chocolate in the microwave in 10 second intervals. Make sure it it completely melted. Then, I dunk the balls in and lift them out with a fork and tap it on the edge to let the excess drip off. Getting the off the fork onto the parchment paper is the trickiest part. I usually shake the ball to the end of the tines and then push it off with another for. Good luck and happy dipping! I made these tonight with the golden oreos! I had to add about 2 tsp. of lemon extract to make them lemony enough, but they turned out well! I also added some lemon extract to the yellow chocolate drizzled on top. Mine were definitely not as pretty as yours, but they taste great! 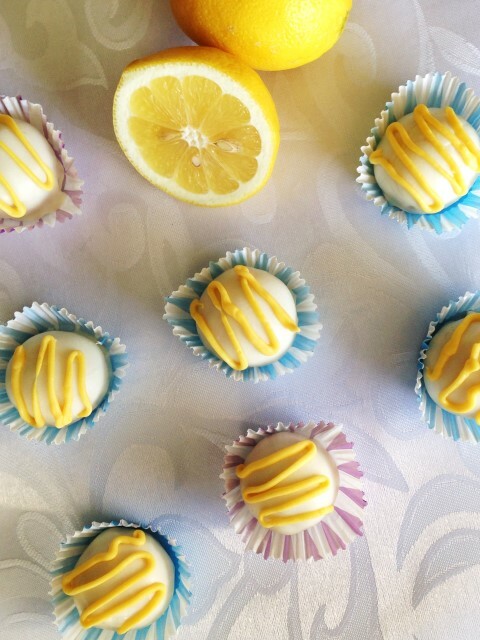 I made these lemon Oreos truffles. I didn’t use white chocolate I use the candy wafer. Some turn out ok. But some didn’t. Could I have use white chocolate. Yes. White chocolate would work too. I found this recipe last year and love it! I am making them for Easter; they are always a hit. I’m glad you loved them, Paula. Went to get lemon Oreos none at 3 stores. Used to have then. I got generic lemon duplex. I’m planning on reducing a little cream cheese and replacing with lemon curd. That sounds good. You could also use golden oreos with some lemon extract.